Laptops have become the preferred option for many computer users. For short periods of time the body can tolerate the poor postures that laptop use creates, however longer periods of use commonly causes the body problems. A desktop computer with a separate monitor, keyboard and mouse allows the user to position each item of equipment to best suit them. Laptops do not allow this. When the keyboard is in the correct position for the arms, the screen is too low and close. 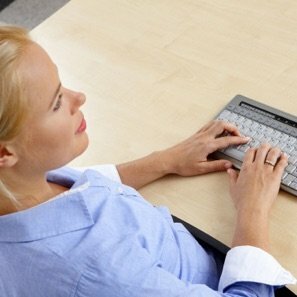 When the screen is at a good height for the head and neck, the keyboard is too high for the arms. For comfort and injury prevention, the body needs to be positioned in a reasonably upright posture with the head balanced over the trunk and the arms close to the body. 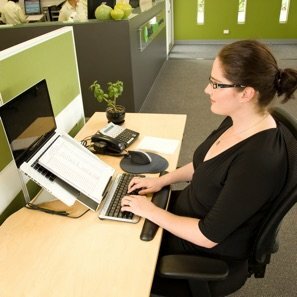 The options below show how a laptop can be used with safe postures. Connect an external mouse and keyboard and position them on the desk with your chair set so that your upper arms are relaxed by your sides and your wrists are straight. This option gives you the same ergonomics as a personal computer as the laptop is simply used as a CPU. This option is preferable if the laptop is your only computer at work. Connect your laptop to a correctly positioned monitor, keyboard and mouse and use the monitor as your screen (not the laptop screen). This option may be preferable if you like using the laptop keyboard. Connect your laptop to a monitor and use this monitor as your primary screen. Position the laptop close to you and use the laptop keyboard and touch pad or connect an external mouse. The laptop screen will sit below the monitor and can be used occasionally as a second screen. If used too much the head and neck will frequently be flexed and tilted downward. If you cannot set your laptop up in one of the ways described above, using it on a slightly angled laptop stand can help. This gives a slightly angled keyboard and slightly raised screen, which improves the posture. Try to limit the lengths of time you work. Stand, move and stretch regularly. If you feel any discomfort stop, change posture and experiment with different positions.